Create a budget position Choose one budget from the budget list. On the Edit tab in the Budget Positions group click New Budget Position. Alternatively double-click on the empty field in the budget positions list. For more information about creating of budget positions, see Create and edit a budget position. Edit a budget position Choose one budget position from the budget positions list. On the Edit tab in the Budget Positions group click Edit Position. Alternatively double-click on an item in the budget positions list. For more information about editing of budget positions, see Create and edit a budget position. Delete a budget position Choose one budget position from the budget positions list. On the Edit tab in the Budget Positions group click Delete Position. Alternatively press DELETE key. Copy and paste Create quickly budget positions with the help of Copy and Paste feature on the Edit tab in the Budget Positions group. Change a budget position status Choose one budget position from the budget positions list. On the Edit tab in the Budget Positions group click Position Status. On the drop-down list click the wanted status. Move a position upward Choose one budget position from the budget positions list and click Move Up in the Budget Positions group. Move a position downward Choose one budget position from the budget positions list and click Move Down in the Budget Positions group. Print a budget positions list On the View tab in the Common group click Print in the Common group to start the quick print feature of the budget positions list. Choose Budget positions in the drop-down list. For more information about printing, see General features and print of the project list, in the Print in the project list. Load budget positions as a template On the Templates tab in the Action group click Load Template. For more information on how to save a budget positions as a template, see Load a budget template. Save budget positions as a template On the Templates tab in the Action group click Save Template. For more information on how to save a budget positions as a template, see Save a budget template. The total amount of all entries is then displayed, when the list is grouped by according column. Drag a column header you want into the area above the budget positions list. 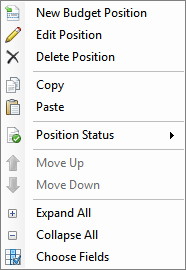 The context menu provides you with almost all basic features that are also on the InLoox PM Ribbon, such as New Budget Position, Edit Position, Delete Position, Generate Actual Revenue, Copy and Paste, Expand and Collapse All Groups, Move Up and Down. It has also such feature as Status, where you can define whether the budget is Not billed, Billed or Note billable. Right-click in the budget positions list to open the context menu. On the Choose Fields dialog box click one field, e.g. Group, and drag it into the column headers. CTRG+C Copy a budget position into the clipboard. CTRG+V Paste a budget position from the clipboard to the budget position list. How to manage budget positions in InLoox PM 7 • Copyright 1999-2019 © InLoox, Inc. All rights reserved.